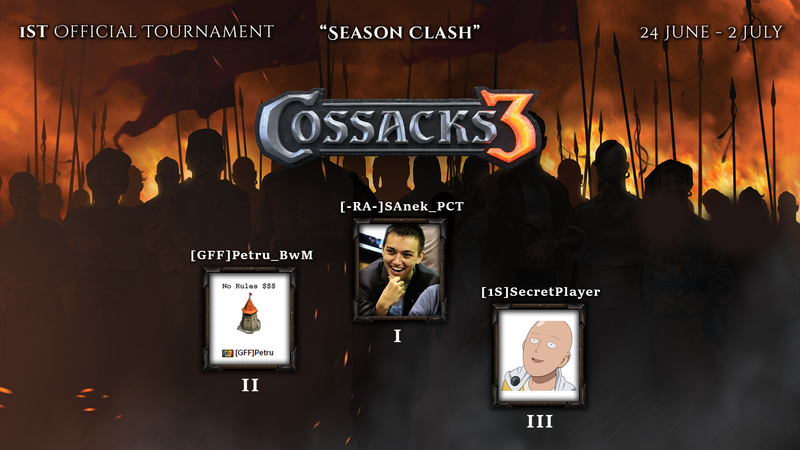 Incredibly entertaining, unpredictable and highly emotional, first official tournament "Season Clash" has come to its end! [1S]SecretPlayer has taken the 3 place and gets 50$ and GSC Anthology key. We sincerely congratulate you, final games were amazing! We are grateful to all our players, which made this tournament so exciting. Most of all, we are grateful to our unique streamers! These people have made the translations so interesting. Thousands of players across the world were watching them! Our honorable, incredible, charismatic streamers and commenters, thank you for everything. Don't forget to subscribe to their channels! Congratulations to all participants of this particular event! We'd like to tell, that new rating season would be started on this Friday. It will end with second official tournament. Thank you everyone and have a nice day!